Cardiac amyloidosis is a disorder caused by deposits of an abnormal protein (amyloid) in the heart tissue. These deposits make it hard for the heart to work properly. Amyloidosis is a group of diseases in which clumps of proteins called amyloids build up in body tissues. Over time, these proteins replace normal tissue, leading to failure of the involved organ. There are many forms of amyloidosis. Cardiac amyloidosis ("stiff heart syndrome") occurs when amyloid deposits take the place of normal heart muscle. It is the most typical type of restrictive cardiomyopathy. Cardiac amyloidosis may affect the way electrical signals move through the heart (conduction system). This can lead to abnormal heartbeats (arrhythmias) and faulty heart signals (heart block). The condition can be inherited. This is called familial cardiac amyloidosis. It can also develop as the result of another disease such as a type of bone and blood cancer, or as the result of another medical problem causing inflammation. Cardiac amyloidosis is more common in men than in women. The disease is rare in people under age 40. The signs of cardiac amyloidosis can be related to a number of different conditions. This can make the problem hard to diagnose. An ECG may show problems with the heartbeat or heart signals. It may also show low signals (called "low voltage"). A cardiac biopsy is used to confirm the diagnosis. A biopsy of another area, such as the abdomen, kidney, or bone marrow, is often done as well. Your health care provider may tell you to make changes to your diet, including limiting salt and fluids. You may need to take water pills (diuretics) to help your body get rid of excess fluid. The provider may tell you to weigh yourself every day. A weight gain of 3 or more pounds (1 kilogram or more) over 1 to 2 days can mean there is too much fluid in the body. Medicines including digoxin, calcium-channel blockers, and beta-blockers may be used in people with atrial fibrillation. However, the drugs must be used with caution, and the dosage must be carefully monitored. People with cardiac amyloidosis may be extra sensitive to side effects of these drugs. A heart transplant may be considered for people with some types of amyloidosis who have very poor heart function. People with hereditary amyloidosis may need a liver transplant. In the past, cardiac amyloidosis was thought to be an untreatable and rapidly fatal disease. However, the field is changing rapidly. Different types of amyloidosis can affect the heart in different ways. Some types are more severe than others. Many people can now expect to survive and experience a good quality of life for several years after diagnosis. 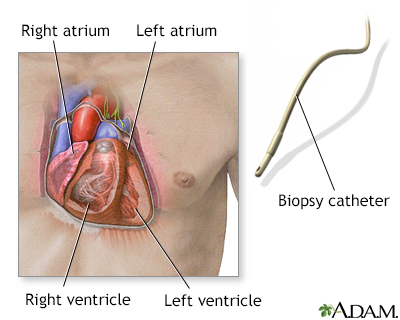 Dilated cardiomyopathy involves enlargement of the heart muscle and is the most common type of cardiomyopathy. The heart muscle is weakened and cannot pump blood efficiently. Decreased heart function affects the lungs, liver, and other body systems.